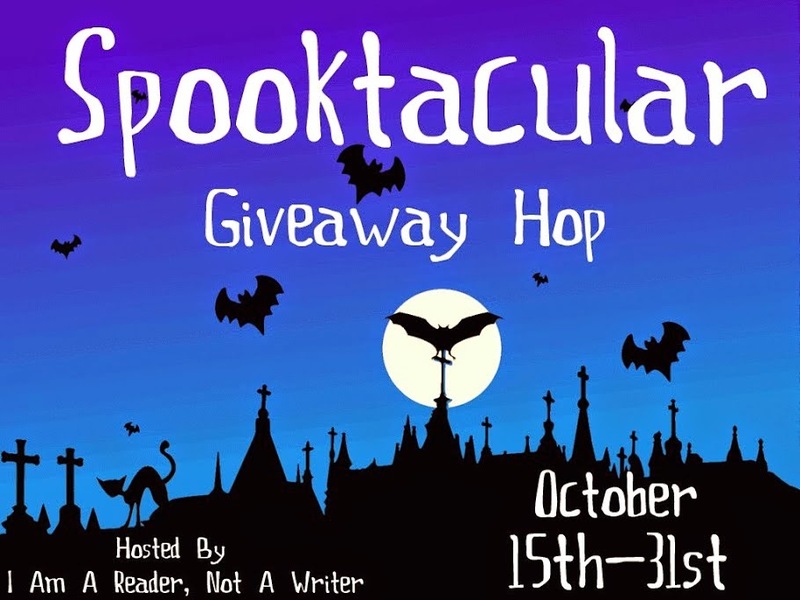 Welcome to the Spooktacular Giveaway Hop hosted by I Am A Reader, Not A Writer! I'm giving away a $10 Amazon GC here at Book Liaison. To enter just fill out the Rafflecopter form below. Don't forget to check out our other giveaways! As of right now handing out candy abd facebook party! I'll just be at home giving out candy. I am working at my daughters school carnival.. Should be a blast, lol. A witch Halloween party! Pass out candy and watch Hocus Pocus! Thanks for the giveaway! I'll be a Despicable Me minion this Halloween! So excited! I'll be handing out candy. I love seeing the kids in their cute costumes. The only plans that I have is to stay home and hand out candy to the kids. Thanks for having the giveaway. My Halloween plans this year is to stay in and watch some classic horror flicks. I do not have any halloween plans this year. I plan to dress up for work and hand out candy to the kids. I love doing that. No Halloween plans other than reading. We do not celebrate in this part of the world! I'll be manning the door for trick-or-treaters and enjoying the costumes! I think I'll stay home and watch some movies! I plan on handing out candy. I'm not sure yet what I'm doing for Halloween but I'm leaning towards going to a 90s themed club night! Staying home to give out candy if any kids show up this year. I'm taking my girls trick-or-treating! In my country we don't celebrate Halloween, but I'd love to because it looks so much fun! I'm going into my mom's fifth grade classroom. :) I'm dressing up as a princess. I'm taking my little grand-daughter out trick-or-treating. I don't have any plans, well, other than staying at home and not answering the door! Stay at home and watch horror movies!! I will stay home and watch Halloween movies!! I will be at home giving out candy and treats to the little ones in their cute costumes!!! We are staying home and we will watch horror movies marathons. I will spend the time with my children, watching movies most likely. I don't have any plans for Halloween. Sadly we don't celebrate it all that much in my country, if at all. So it'll pretty much be a normal friday. Thanks for the great giveaway! I'd planned on having a small party or something with my friends but I just realized I had a test the next day :( So probably studying. Well, my daughter had tonsil surgery a few days ago. She might not feel up to trick or treating. But that's our plan right now! I will be taking my 7 year old grandson out trick or treating. We have no Halloween plans aside from my husband giving out candy at the door. No Halloween plans at the moment and will probably end up giving out candy. We are staying in and handing out candy this year! We go out each year as a family - fun for everyone. We make a goal to try and beat last year's record for candy. I have plans on sitting outside and handing out candy. Love Halloween. No plans, as we don't celebrate it over here. I'll probably be home handing out candy and reading the rest of the time. I"m going to a Halloween party at a real haunted building! The only thing planned so far is to pass out candy to the lads and lasses. Thanks for the chance! I will be taking my children trick or treating. If the weather is too cold and rainy, we play Halloween theme games at home instead. Every year a bunch of us go to the midnight showing of The Rocky Horror Picture Show. I'm going to dress in costume, and spend the evening with my mom, eating "spooky" treats and watching movies. I'd like say that we'd be on the look-out for trick-or-treaters, too, but we never get anyone anymore. I'm going to be handing out candy to the kids. Going to visit husband's grandmother , she hasn't been doing well and he will finally have a day off :) plus she loves halloween. My plans are to hand out treats to the neighborhood kids. I'm just staying home and handing out candy. I don't have any plans for Halloween. I will take my sons trick or treating! I just plan to watch a few scary movies. I decorated the house and will probably give out candy. I plan to watch a horror movie. Watching scary movies and making some Halloween sugar cookies. My Halloween plans are the same as always, handing out candy. I love seeing all the children in their costumes and their bright eyes when you give them candy. I remember trick-or-tricking is it was one of the funniest things I ever did. No real plans here, have candy, television and we live at the top of a dark hill in the country and do not get trick or treators, but I still buy the candy..lol need some excuse. I have a wedding to attend! Before the wedding I will give out candy to any trick-or-treaters that show up though. Work, followed by horror movies with munchies! Going for a drive probably. I'm taking my children trick or treating.